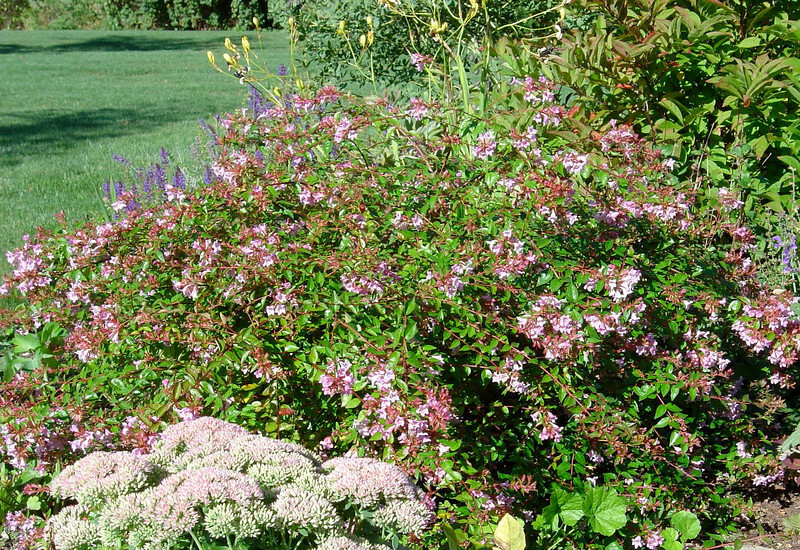 Abelia 'Edward Goucher' - This is an evergreen shrub that grows 4-6 feet tall and as wide in mild climates. The glossy 1/2 to 3/4 inch long leaves clothe arching branches, foliage is bronze tinged when young. From early summer until fall an abundance of lilac-pink bell-shaped flowers with orange throats are produced. Fall color is enhanced by bronzing of foliage and persistent copper-colored flower sepals. Looks best when pruned selectively although tolerant of hard shearing. Can be cut to the ground to encourage new long arching branches. Plant in full sun to light shade. Low water needs along coast but looks best with moderate irrigation. Hardy to 15 F. It can be used as a shrubby border or as a screen.